What’s holding back recovery? To understand this, we need to understand what kind of economic crisis we’re trying to recover from in the first place. When the economy is supply constrained or “overheated”, this means that consumers have money and are ready and willing to buy goods and services, but suppliers are unable to provide enough goods and services to satisfy consumer demand. This can happen if employers are unable to hire the workers they need to expand production, and it can happen if there is a shortage of an important commodity, like oil. There are several reasons why employers might not be able to hire additional workers. There could be a skills shortage, unemployment might be too low, or wages may have risen too high. In all of these cases, the result is rising inflation—because suppliers cannot provide more goods and services at the same price level, they raise the price level until supply and demand are at equilibrium. If the problem is a skills shortage, wages will rise rapidly in the particular skill area needed while inflation rises, in which case the state should incentivize people to acquire the requisite skills and potentially raise interest rates to stop inflation’s momentum. If the problem is low unemployment, wages will rise rapidly across the board while inflation rises, in which case the states should raise interest rates to increase unemployment and stop inflation’s momentum. If the problem is high wages, wages will rise or stagnate across the board while inflation rises, in which case the state should weaken unions and raise interest rates to stabilize wages and stop inflation’s momentum. If the problem is a commodity shock, the price of the commodity will rise rapidly while inflation rises, in which case the state should find a way to restore the supply of the commodity, seek a replacement for the commodity, and potentially raise interest rates to stop inflation’s momentum. 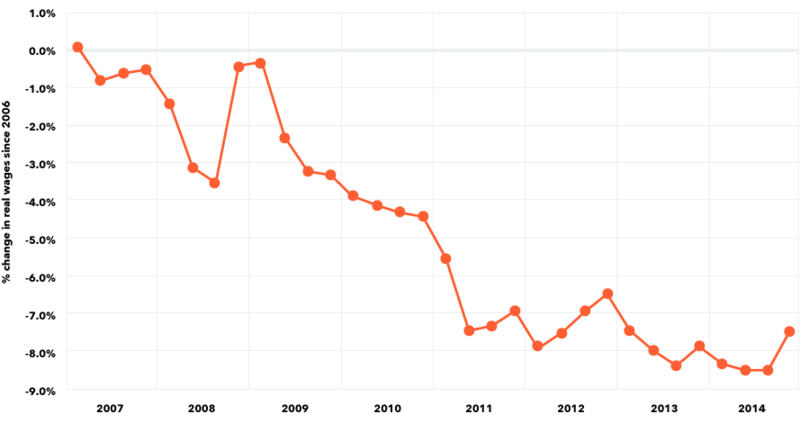 A commodity shock can create inflation even when wages are stagnant and unemployment is high. This is called “stagflation”. The only country examined to have a substantive rise in inflation is the UK, and even the UK inflation rate has fallen recently, from an annual high of 4.5% in 2011 to 2.6% in 2013. During the 1970’s, when the US economy was supply constrained, inflation rose into double figures. Even at the peak of the UK’s inflation in 2011, the rate did not top 5%. 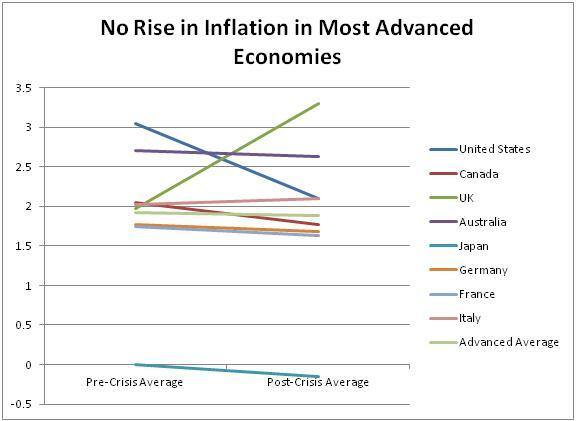 With inflation averages falling in the other countries (especially in the US), it does not look like the economic crisis was driven by a supply problem. When the economy is demand constrained, this means that consumers do not have enough money to buy the goods and services required to support the economy’s growth. This happens whenever consumers’ incomes fail to keep up with economic growth. There are a variety of causes that often work together to undermine consumers’ incomes and create a demand crisis—high unemployment, underemployment, welfare cuts, state austerity, wage stagnation, and credit crunches can all play a role. An individual’s income available for consumption is typically fuelled by a combination of wages and borrowing, and a threat to either of these things undermines the individual’s income and consequently his capacity to consume. We might remember that the global economic crisis was kicked off by a classic credit crunch. In the United States, homebuyers were frequently being issued “sub-prime” loans to people with limited incomes. Financial institutions believed that home prices would rise indefinitely, allowing borrowers who ran into trouble to sell their homes and recoup their debts. When the housing bubble burst, housing prices collapsed and many borrowers went “underwater”—the amount of debt they had on their homes exceeded the value of their homes. This meant that when people couldn’t repay their loans, they could not simply sell the house to someone for more money. Instead, they would have to default on their mortgages. Financial institutions failed to foresee this possibility, creating many “mortgage-backed securities” (financial products whose stability relied on mortgages) and circulating them throughout the global financial system. When the mortgages began to fall apart, the securities began to fall apart, and the banks that held those securities followed suit. With the banks in retreat, it became very difficult for consumers to take out affordable loans at reasonable interest rates. This limited consumers’ access to credit and depressed purchasing throughout the economy. Governments all over the world responded with a series of bank bailouts. In effect, states assumed the banks’ debt obligations. This stopped financial collapse, but it put many states in difficult fiscal positions, resulting in austerity policies in many countries, particularly in Europe. These cuts to government spending have hurt income growth and hampered the economic recovery. So what’s the solution? To raise consumption, governments must raise consumers’ incomes. They can do this either by increasing borrowing or by increasing wages. As we’ve seen, trying to drive economic growth with borrowing is an inherently unstable enterprise. There simply isn’t enough wage income in the system to sustain the large debts that would be required to drive consumption with borrowing. Unfortunately, governments seem not to have learned this lesson. Governments have prioritized quantitative easing (QE), in which states’ central banks (e.g. the Federal Reserve, Bank of England, European Central Bank, etc.) buy bonds from financial institutions in exchange for cash. These policies put lots of money into the hands of banks with the hope that banks will once again begin lending it out at low interest rates. The trouble is that even if this works in the short run (and the evidence on this is mixed—banks seem to have become a bit more cautious, at least for the moment), in the long run consumers need a wage increase if they are to repay whatever future debts they incur. More borrowing is not the answer. Raise the minimum wage, directly improving the consumptive abilities of poor workers while indirectly pushing up the rest of the wage scale. Expand union rights, increasing workers’ bargaining power. Increase government spending, creating high-paying public sector jobs. Cut taxes for the lower and middle classes, giving them more of their incomes to spend. How does the government know when it has done enough? When the economy is no longer demand constrained, it will begin to show signs of being supply constrained, and that means inflation will rise. When inflation rises, that will likely mean that the government has done enough for consumers for the moment and needs to look for ways to help suppliers expand their capacity. It’s a balancing act. Reblogged this on A People Portland. Thanks for this insightful analysis. I am glad we do not have to choose between peoples rights to survive, and what is good for the economy, but the two are the same, at least in this situation. I’ve joined the fight for 15, and organizing with others in my community to raise the minimum wage to 15 an hour city wide in Portland Maine. Thanks for helping bring a more economic based perspective to this fight. You’re welcome–thank you for reading. Best of luck in your efforts to raise the minimum wage! I like how this is different from what I’m usually exposed to, which is that regulation of banks is the main issue to fix. Raising income levels tackles the fundamental problem of wanting to consume more (and thus reduces debt levels), but don’t you think that counter-incentives to borrowing is needed before raising income levels? We need to handle both sides of the issue simultaneously. If we reduced borrowing before we raised wages, we would cut consumption, harming economic growth and potentially pushing more countries into secular stagnation or recession. This would further inhibit wage growth, making it more difficult to rebalance the economy and achieve sustainable long-term growth. Any attempt to reduce borrowing must be accompanied by policies designed to push up wages. The aim should be to maintain or expand consumption while shifting the source of consumer income from loans to wages. I’ve used your idea of low growth in real wage to linked it to the desire to consume and greed. And I targeted greed, which I argue to be promoted by our current financial system, as the main issue to resolve. I want to get your academic on the ideas I mentioned, and the worthiness of this sort of analysis (it is much less economic-specific). I am interested in journalism, and helping others understand difficult economic circumstances, thus my tone is rather sensationalised and not really academic. I’ve read your piece. I think the focus on greed as the source of our ills is a mistake–a better question is why people are greedy in the first place. Where do these desires come from? Are they intrinsic to human beings or are they socially learned? If greed is socially learned, it will be very difficult for our society to simply renounce it, and if greed is an intrinsic human quality it cannot be renounced. Rather than attempt to renounce greed (which is difficult and perhaps impossible), we need to construct a society that controls that greed and channels it to good purposes–that makes it sustainable without causing economic and human catastrophes. There was a period in our history when the financial system was regulated more tightly, unions were stronger, and states made more of an effort to promote sustainable wage growth. 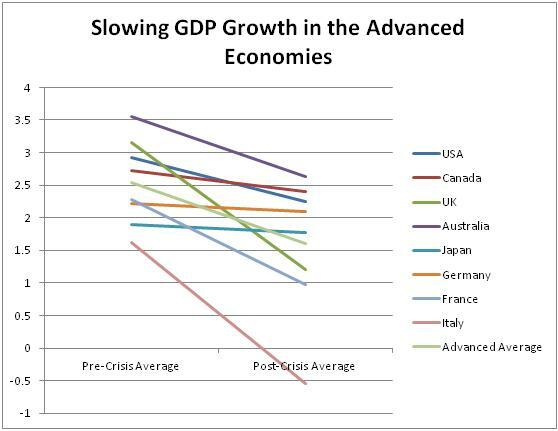 In this period, economies not only grew in a more sustainable fashion, but they grew faster than they do now. We were able to have it all–to be greedy and achieve sustainability at the economic level. The trouble is that our political system was not up to the task of maintaining the sustainability of that economic system. We need to ask why the regulations were rolled back, why unions were weakened, why the state lost interest in wage growth. These questions invite us to attempt to diagnose fundamental problems within the political system. Perhaps it’s voter ignorance, or excessive political money, or a poorly educated political class, or some combination thereof. If we were to solve the political problem, it follows that we would be able to restore a sustainable economic system without asking individuals to unrealistically renounce deeply ingrained human traits. We need to change our system, not our natures. Thank you – that gave me clarity, not just on the subject matter but on the method of my deductions. I tend to accuse the instinctive human trait when it is more helpful to analyze the characteristics of things we know to have created. But maybe im not targeting the human trait of greed per se, merely the trait of monetary greed, which is influenced greatly by the financial system. We can have the greed to be satisfied, and monetary greed may not be a factor in it. Back to my first point – You’ve showed me how it is more useful to talk about changing the political system, and not our nature. It is only more useful because it is ‘easier’ to change our political system (we’ve created tools to define and affect it). But being an ‘easier’ tool to use and affect change, when the change we want to see is deductively in the extent of our monetary greed, is circumventing an attack on the problem of monetary greed itself. I feel that we cannot change our fundamental characteristics, but trying to mould it will subtly change our natures, and small changes is vital. Even if greed exists inherently, there is a spectrum of greed – both too much and too little greed is socially ineffective. It is important to deduce between the good side and bad side on the spectrum of greed (or any other inherent trait), to socially optimize the effectiveness of our constructs.